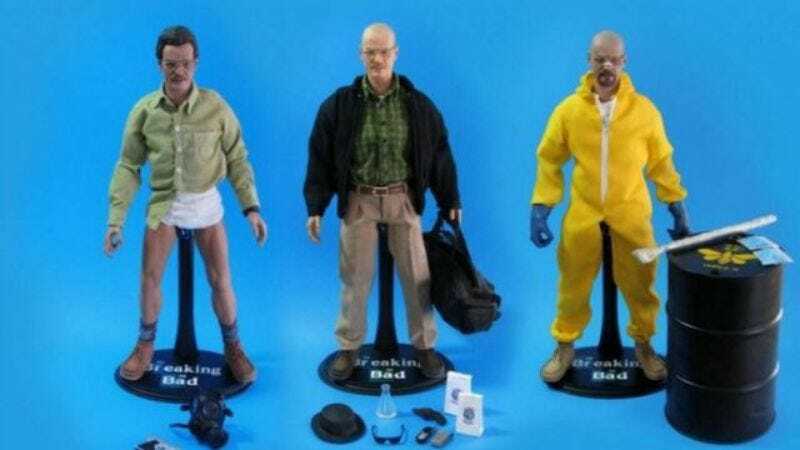 Toys R Us has learned that its best course is to tread lightly, apparently, as the toy chain has pulled its line of Breaking Bad toys in the wake of a Florida mom’s protest of the meth-peddling action figures. “Let’s just say, the action figures have taken an ‘indefinite sabbatical,’” a Toys R Us rep tells The Hollywood Reporter, presumably adding that the toys were last seen driving off into the desert and it would be best not to ask any more questions. The news will be seen as a victory for Susan Schrivjer, the Fort Meyers mom who collected 9,300 signatures on her Change.org petition to protect children from being exposed to meth dealers inside Florida toy stores, as opposed to just in the parking lot. Schrivjer is expected to release a statement to the effect that she is not in danger, she is the danger, and a mom walks through the sliding doors of Toys R Us and is offended, and that is what they think of her? No. She is the one who offends. Something like that.